a small, good thing are the hybrid offspring of ethno-tribal-ambient heavyweights O Yuki Conjugate and Purr. 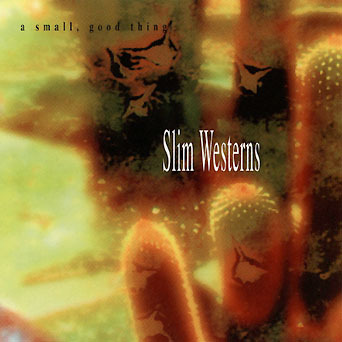 ‘Slim Westerns’ is their debut album, an ambient rodeo for the vaporspace. Imagine equal portions of gauchos, guitars, and peyote simmered for hours over a slow fire, and served with a big bottle of tequila. Add a dash of outter space and you’ve got a small, good thing. three northern Englishmen who’ve never been to America, writting music for Westerns that will never be made. ‘Slim Westerns’ is the result their fascination with The West and it’s mythology. After five years of writting and recording in Leeds, York, and London, a small, good thing have produced a album of sly sketches for lonely landscapes, a desert sort of music: slim westerns, maybe.